In a normal year, these days would see the Stateside church storm the nation's capital with bells on to carry out American Catholicism's most prominent act of advocacy in the public square. For the millionth time, however, these days are anything but normal. That tomorrow's March for Life was destined to unfold in the epicenter of this season of scandal was always bound to make for a tricky confluence. And that was before the last week turned Washington's Catholic scene even more roiled, battered and irate than it had already been. Now held on the Friday before the 22 January anniversary of the Supreme Court's 1973 ruling in Roe v. Wade, the annual interfaith demonstration against legalized abortion – long the city's largest annual protest – has historically been the District fold's showcase moment, a reality only amplified by the 800,000-member archdiocese's remarkable growth over the last two decades. But now, with the ongoing fallout of multiple abuse allegations against now-Archbishop Theodore McCarrick freshly compounded by Cardinal Donald Wuerl's extraordinary scrambling upon last week's disclosure that he had learned of his predecessor's misconduct with adults in 2004 – two years before his own promotion there – to say that the mood on the ground is "fit to be tied" is putting it mildly. Three months since Wuerl's long-delayed resignation as archbishop was accepted by the Pope – but with the 78 year-old cardinal remaining in charge until his successor is installed – the embattled prelate was still slated to take a major role in the March events, above all in keeping the presider's chair for the archdiocese's massive youth rally and liturgy in the capital's basketball and hockey venue for some 20,000 pilgrims (below). 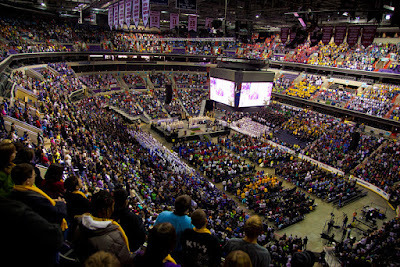 Yet after the DC Chancery took a notable degree of quiet objections over Wuerl's presence in the wake of the latest fiasco, only yesterday was it announced that the Nuncio to the US, Archbishop Christophe Pierre, would fill in as celebrant at tomorrow morning's rites in Capital One Arena. While there are no indications to date that the process has reached its final stages, as previously reported here, the next archbishop is expected to emerge before February's Vatican abuse summit. Still, with the Washington church already reeling from McCarrick's removal from ministry last June and the subsequent tumult over allegations of Wuerl's mishandling of cases in August's Pennsylvania grand-jury report, the developments of the last week have served to up the stakes of the succession even further – as if the move hadn't been "too big to fail" before. As context goes, one key aspect bears recalling: significant as it is on its own that Washington's last two archbishops have now brought grave discredit to the office – and all in a matter of seven months – the situation is intensified in that the DC church's brutal cycle represents the archdiocese's first local immersion in the crisis. With Cardinal James Hickey widely credited as having done the kind of cleanout that most other places wouldn't broach until 2002 and its wake through the 1980s and '90s, even as the scandals have ricocheted from coast to coast over the last 17 years, when the daily drip moves from the National section to the Metro page, it becomes a whole different reality. 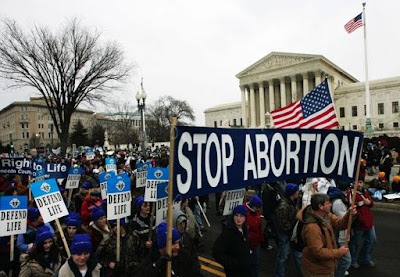 In a normal year, the March for Life – beginning with its jammed vigil in the Basilica of the National Shrine of the Immaculate Conception – attracts somewhere around 100 US bishops. Again underscoring the state of things this time, tonight's opening Mass barely managed to draw 40 of them... and instead of the standard six or so cardinals on hand, tonight saw all of two (with Wuerl and Cardinal Timothy Dolan – currently facing his own heat over a recent case in New York – both conspicuous by their absence). To be sure, some of the depressed turnout can likely be attributed to an intense round of winter storms running cross-country. But not a drop like this. All told, it should be a hale season for the Catholic movement against abortion – 46 years since Roe, a Republican administration whose premium on the unborn is matched only by its targeting of immigrants has just placed a second justice on the Supreme Court, while a mix of freshly-enacted state laws and evolving public attitudes have brought the number of procedures to a historic low: for the first time, even fewer than took place in 1973 itself. Nonetheless, the shadow of the scandals could clearly be felt looming over a traditionally exuberant occasion. In his first turn at a homily that, by long practice, doubles as a "State of the Movement" address, the new USCCB Pro-Life chair, Archbishop Joseph Naumann of Kansas City in Kansas, had little choice but to note that "the failure to respond effectively to the abuse crisis undermines every other ministry of the church." The sense was further punctuated by the complete lack of applause during a preach that usually overflows with cheers.